Have you ever wished for a straighter, healthier smile, but not looked forward to all the metal wires and bands that often go along with braces? With your Hoover, Alabama dentists, Perrigo Dental Care can make your dream of having a new smile come to life, and without any metal! Dr. Perrigo is a certified Invisalign® provider, giving patients a “clearly” effective and incredibly comfortable way to wear braces! Though Invisalign® isn’t the best option for extreme cases; it is a very good option for people who have minor misalignment, crowding, or gaps. 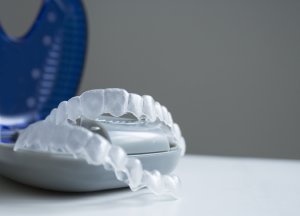 Based on your individual needs, your dentists in Hoover, Al will be able to tell you whether Invisalign® is a good option for you. Brush after every single meal, no exceptions. If you choose Invisalign®, your oral hygiene habits will be put to the test! Making sure you brush after every meal (even if you just grab a fry off of your friend’s plate), taking your trays out if you’re eating or drinking anything except for water, and cleaning your teeth and then the trays are all a part of treatment. At our Hoover, Al dental office, we strive to provide a consultative approach for every patient. We want you to fully understand your treatment options before any work has begun, so you are confident in your choice in your treatment and your choice in our practice. When you are ready to learn more about you or your child’s smile transformation, click here to schedule an appointment with one of our specialists at Perrigo Dental Care. We can’t wait to welcome you as a member of the Perrigo Dental Family.